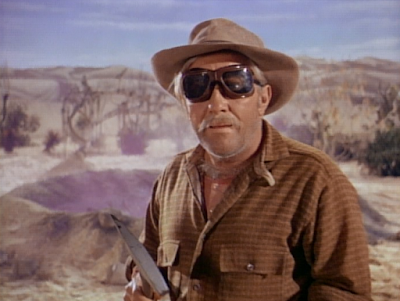 In the season premiere of Lost in Space (1965-1968), season two, a reckless miner from another world, Nerim (Strother Martin), searches for the valuable substance “Cosmonium” on Priplanus. Unfortunately, Nerim’s lack of attention to safety begins a catastrophic chain reaction. All of his blasting in the planet’s interior has caused an irreversible problem. In just twelve-to-fifteen hours, the planet will explode. 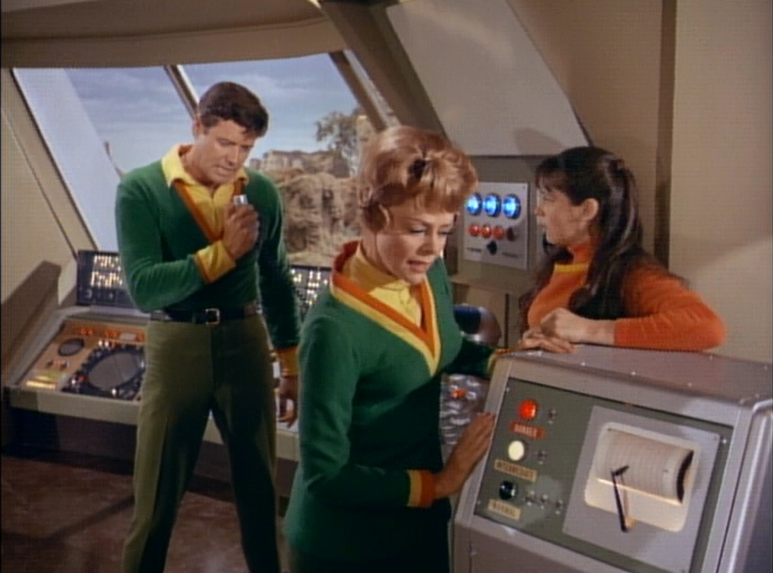 The Robinsons work desperately against the clock, making final preparations to lift off and leave their home. 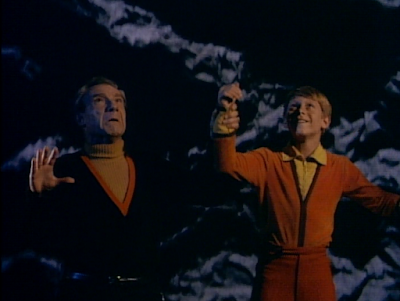 Dr. Smith (Jonathan Harris), unfortunately, has different plans. He wants to possess Nerim’s valuable Cosmonium, and gambles for it in a card game with the miner, using a crucial thruster unit from the Jupiter 2 as collateral. 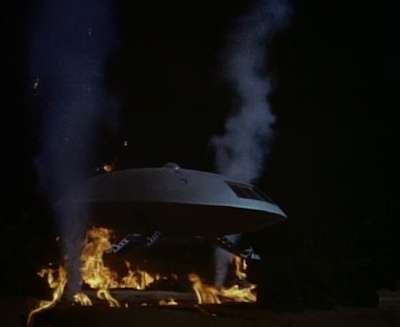 The thruster is lost to Nerim, and he promptly flees the doomed world, leaving the Robinson family behind. As the planet nears total destruction, the Cosmonium causes a statue of Dr. Smith to come to malevolent life, and other perils threaten the family too. Finally, the Jupiter 2 leaves Priplanus with all hands aboard, just as the world is destroyed. But now the ship is on a collision course with a red dwarf! The first thing to note about Lost in Space season two, perhaps, is that the series looks fantastic in color. More than ever, the series resembles a lushly-colored, vividly illustrated and highly-imaginative fantasy comic strip. The Chariot, the rocket pack, and the Jupiter 2 exteriors and interiors all look fantastic outside of the first year’s black-and-white photography. 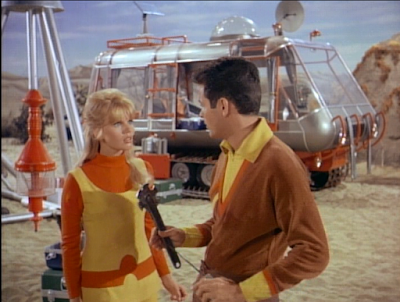 The Robinsons' clothing is kind of garish in color, but also visually striking. Indeed, all the creative problems that came to hobble the series late in the first year (in the run between “The Challenge” and “Lost Civilization,” in particular) return in force to impact the storytelling here. First and foremost of these problems is the pervasive earth-centric thinking. In “Blast Off into Space,” for example, we meet Nerim the miner. But he is presented here like a late 19th century miner (of the Old West) rather than as an alien or futuristic miner. 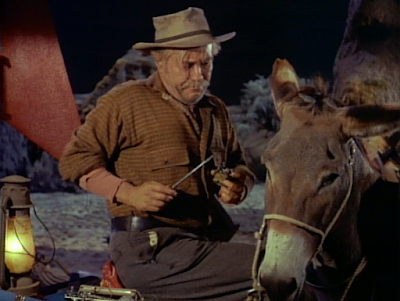 He is accompanied by a mule, uses a pick-axe, and wears and Old West wardrobe. He is a creature of the past, not of the space age, or of an alien culture. There is no imagination, in other words, in his depiction. Once more, the question is, simply, how did the equivalent of a 19th century Earth miner arise as a citizen of another planet? And how come he can travel from planet to planet, but the Robinsons can’t? To our eyes, they’re all human beings. So why doesn’t Nerim help the Robinsons, or allow them to join the galactic culture? Secondly, “Blast Off into Space” is predicated almost entirely on the idea of Dr. Smith getting into trouble, and acting badly. He gambles away a critical thruster unit. 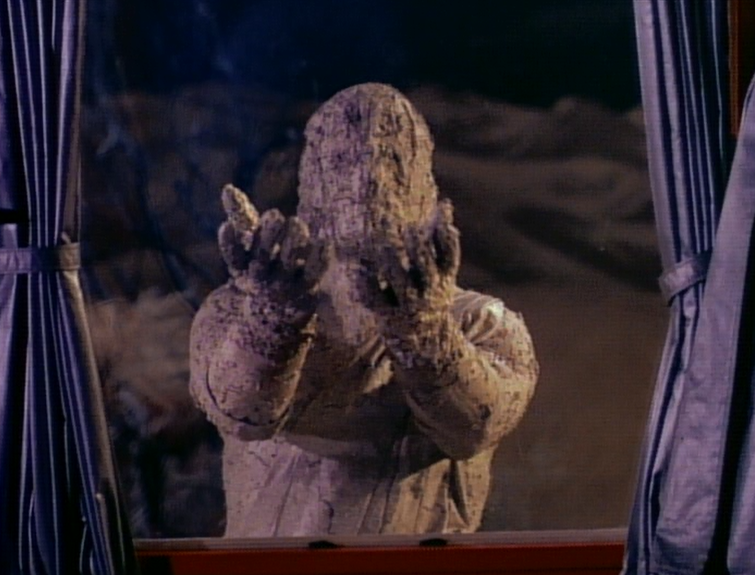 He creates a statue of himself that comes to life when he accidentally spills Cosmonium on it. He tries to partner up with Nerim, leaving the Robinsons behind to their fate. By now, we expect Smith to be greedy, cowardly and buffoonish, but it is tiresome that Smith’s behavior is always the entrance point into the narrative, the thing which creates stories. It would be much more interesting, from a dramatic stand-point, to have the Robinsons discover the planet's instability. 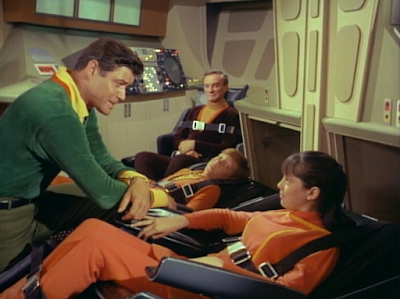 Thirdly, “Blast Off into Space” has little regard for series history. The Jupiter 2 escapes from doomed Priplanus, but there is no mention of the fact that thousands of aliens in a subterranean world (including a child princess…) will die when the planet crumbles. In “The Lost Civilization,” we met the princess and saw her soldiers frozen in suspended animation tubes. We met her major domo (Royal Dano). No notation is given here about any of them, but if Priplanus dies…they all die, right? It would have been great to have Will exclaim “The Princess!” at one point, just to remind us that Priplanus was populated by humanoids other than the Robinsons. What “Blast Off into Space” adds to the Lost in Space creative equation, perhaps, is a kind of frenetic approach to action. The episode never settles down or lingers in one place, or with one plot-line for long. 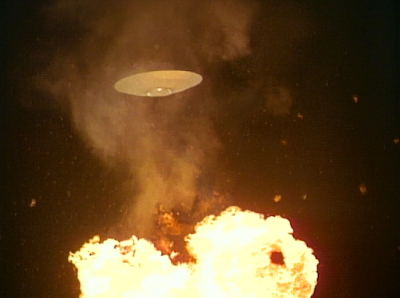 Between the action and special effects pyrotechnics, the episode is stunning in the visual sense. For example, we get a weird anti-gravity chute in a mine, an attack by a creepy monster, a search (by John Robinson) of the planet in the air, and a last-minute escape by the Jupiter 2, and other set-pieces. These moments don’t all gel together, but the surfeit of action means that the episode is, at least, never dull. The story ends with promise, with the Robinsons unshackled from planet-bound adventures, and free to roam space. But I have an unhappy suspicion that this will turn out to be more potential unfulfilled. I recently read an old interview with Jonathan Harris, and what he says about the character of Dr. Smith is enlightening, and may help you get through most of Season Two: "I created that man [Smith]...all his foibles. And really what I created was all the kids I'd ever met. Put them all together and out came Zachary Smith. Oh yes; I was the absolute child, and that's why they all loved me. Because I got away with murder. I got away with murder, didn't I?" When I watched the show as a child, I used to view Dr. Smith as a cartoon character. I thought that no one like him could ever exist in real life. Now that I'm older, I've discovered that Smith is actually a better person than many of the adults I've met in the real world! I enjoy "Blast Off Into Space," which seems to work in spite of itself. It is really exciting. Not only do we finally get to see Priplanus in glorious, full color, the musical score by Leith Stevens is quite excellent. This episode sets the tone for the rest of the season, as we become Lost In Smith. We're a long way from "Follow The Leader" now, even though that was only one episode ago! WIth this ep, Lost in Space plunges into the idiotic. An old west prospector, a liquid that brings statues to life and on and on. Season one's space hillbillies were only a taste of worse to come this season. Lost in Space now became a show which pandered to the Seasame Street crowd. I have not seen this episode in years but I remember a certain viewing in my teen years; specifically 1978. My reaction was one of disappointment. It sure looked great when I was a kid! Lost in Space crashed way before "Blast Off Into Space", but this time did it in colour (color)... On Eastman Kodak emulsion 5251. Glorious. This series had 'conventional' elements like 19th century prospectors, and tools, because it had a very modest budget, certainly for a fantasy show. The money was in line with that of any earthbound hour-long dramatic series of that time.